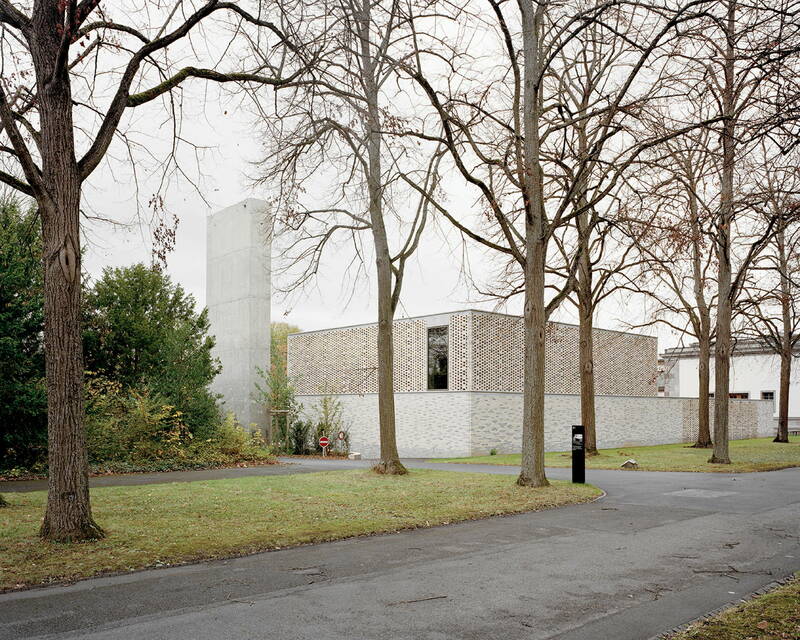 The design by Bernhard Maurer and Frederic Garrigues won the competition for the new crematorium at the Hörnli cemetery, Basel. 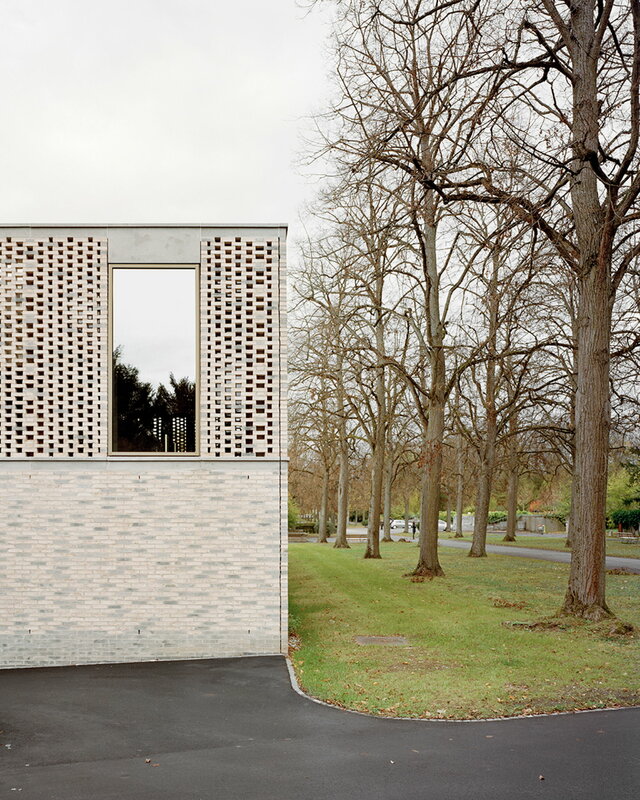 Rigorous geometry sculpted in concrete and with brick decoration fits appropriately into Switzerland’s largest cemetery. 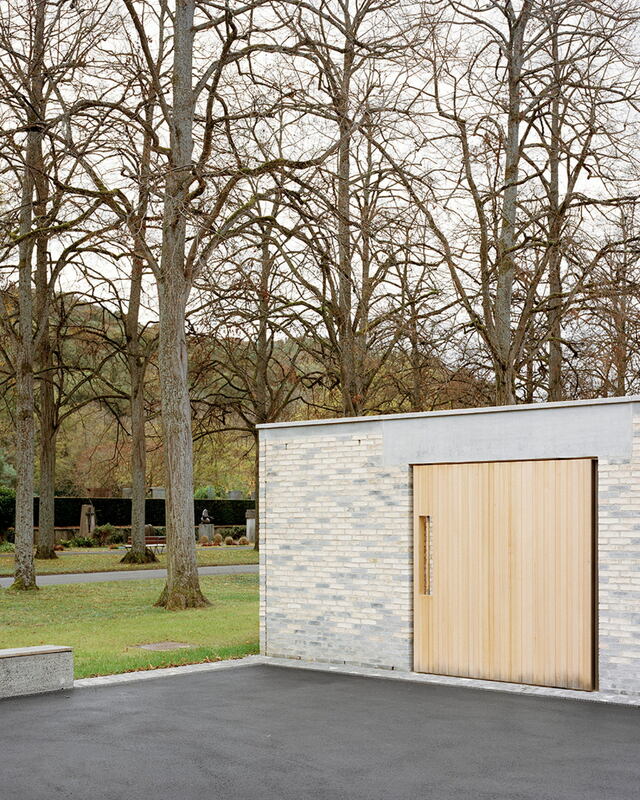 Architects Bernhard Maurer and Frederic Garrigues founded their studio after winning the competition for the new crematorium at the Hörnli cemetery, Basel, in 2012. They divide their time between Paris and Zurich and today they are working on a second winning design for a school in Romanshorm. Designing a new building for the Hörnli cemetery in Basel means working on a monument that is known by the Swiss population, not only because it is the city’s main cemetery, but also because it is the country’s largest. The general project for a central cemetery in Basel dates back to 1919, when it was approved by the Grand Council, the parliaments of the 26 Swiss Cantons. Built between 1926 and 1932 by the team of architects Bräuning, Burckhardt, Klingenfuss, Leu and Suter, it is on the outskirts of the city, at the foot of the mountain in the Riehen quarter and is home to around 40,000 graves, loculi and family tombs. It has 50 hectares, organised into a large park and gardens, designed so that the greenery recedes to make a little space for the loculi and not vice versa. As it is located on the Hörnli hill, it is also designed to offer a beautiful view of Basel and visitors can see the museum, which displays important funeral objects linked to Swiss culture. The cemetery, created as a place of worship, reflection and silence, but also a microcosm combining artifice and nature, is a monument to the past, both that of man and of history, which he tries desperately to bring back to the present day by preserving it in a monument. Architects Bernhard Maurer and Frederic Garrigues were asked to design the new crematorium right in the centre of the cemetery, near the monumental staircase in the main avenue of the area. They took extreme care with their design and in the volumetric result of the whole. Their design was based on the superior geometric order that guides the cemetery’s Classicist design, offering an initially Rationalist interpretation of the relationship between life and death. 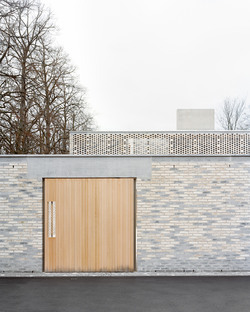 The new crematorium is in the same style, becoming a further stage in the experience of passing away, which can be immediately recognised by people, shared by many religions and by all levels of society. Along the main avenue, the building appears as an independent volume, but one that is in line with the existing mortuary. A large doorway gives access to a new inner courtyard, which is an intermediary space between the existing structures and the new ones. Beyond is an enclosed courtyard that provides an intimate, semi-public space open only to those taking part in the ceremony, which allows a slow approach to the final stage. The sequence of spaces ends in the cremation room, whose volume develops upwards, with a large window opening onto the sky. Apart, to one side is the bare, prismatic tower of the chimney. The materials were chosen to create a strong contrast between the structure and the external covering of the building. The concrete structure gives stability, maps the boundaries and anchors the building to the ground. Brick was chosen to bring lightness and transparency and is used not as a wall or screen, but as a passageway, as a means of looking beyond.In fact there are many perforated bricks that offer a further perspective of nearby spaces, symbolising another dimension in which sorrow ends. Light and air contribute to this experience and enter and permeate the intermediary spaces in brick.